“Control boy control…you can’t act on every thought that comes in your head!” said grandpa with affectionate aggression. Well! He isn’t around anymore, nor am I a boy anymore, yet the words still echo in my mind as I write this piece. It’s amazing, isn’t it? What he said to the ‘distracted me’ while teaching something has stayed with me long after I have forgotten what he was teaching. In the words of William James “Will power is the ability to ‘emphasize, reinforce or protract’ certain thoughts over others percolating the consciousness”. Wow! What a definition! Concise yet self-explanatory. 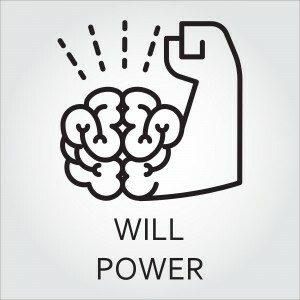 But this notion of will power as a gatekeeper raises a question: how does the gatekeeper decide which thoughts to let pass and which ones to turn back? Well! The possible courses-of-action in front of the gatekeeper conjure up in brain based on a person’s memories, experiences, values transmitted by the larger society, and present circumstances. And the willed mental effort on choosing one of them takes place in the upper-outer-front portion of the brain. But this portion has a peculiarity, which makes the will-power a finite resource. Yes, will-power or self-control is a finite resource. It gets consumed and has to be refilled. Thus it is crucial to utilize will power by applying discretion in scheduling one’s actions and interactions in a manner that helps you save it for important occasions during a typical day. Having said this, while you should apply ‘emotional & social intelligence’ to manage will-power, you should also try to strengthen it. One way is to make a conscious and consistent effort to increase attention (what they call ‘awareness’ in spirituality). This directed mental force of ‘attention’ begins as a fragile, undependable process but gradually becomes stronger with practice, and starts influencing our choices in those precious milliseconds regarding ‘what we do’ in response to ‘what has happened to us’. The roots of all these concept are in the ‘neuroscience of human behavior’. When you understand the ‘structure and functioning of human brain’ and combine it with behavioral concepts, the resultant ‘emotional & social intelligence’ helps you excel in intrapersonal and interpersonal aspects. Yes, emotional & social intelligence is the science of managing self and connecting with others. This science can be learnt, practiced and mastered. However, it all begins with some simple yet profound realizations like…‘Will-power is a finite resource’. Note: Socialigence (www.socialigence.net) offers self-paced video-based online course on ‘Emotional & Social Intelligence’ with content that has global relevance and presentation that is specifically customized according to the work-scenarios in India.